How beautiful a day can be when kindness touches it......I love this sentiment! It is great for thank you cards! 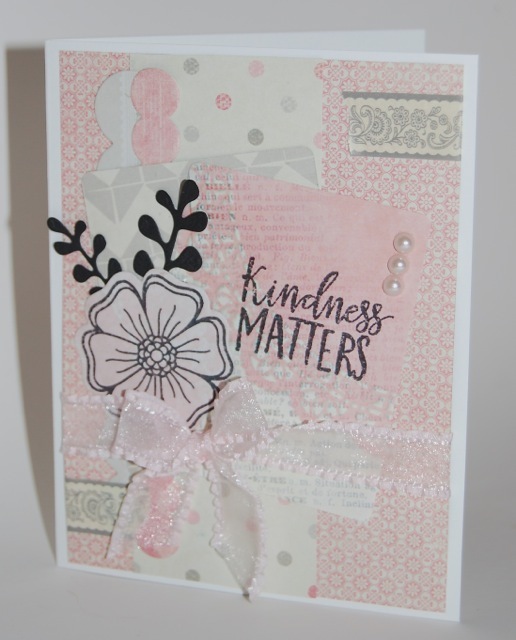 The recipe for this card includes: digital papers from Harper Finch, Verve's Kindness Matters stamps with matching dies, and the second VLV sketch for the month of October. The color options ---orange, green, and purple are the part of the Fun Friday Challenge at Jo's Scrap Shack. After setting out to create with a particular stamp set and color palette, things just weren't working. 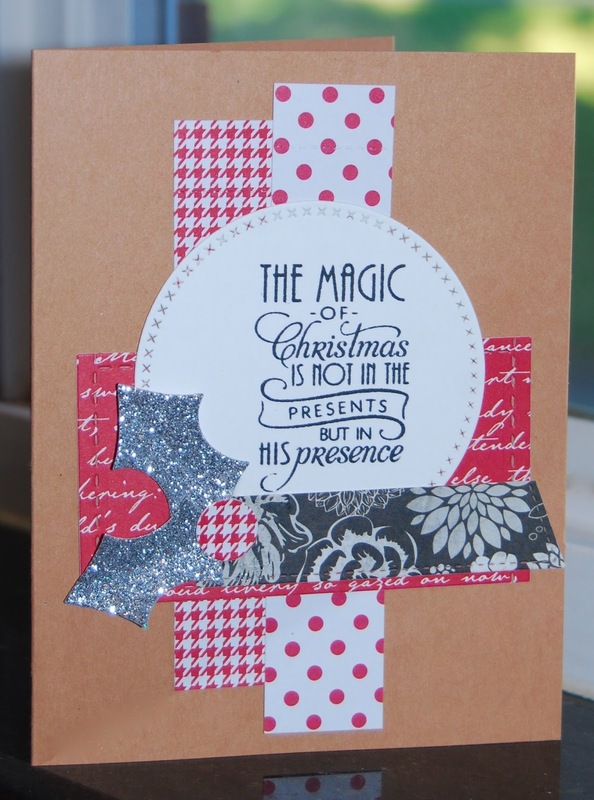 Enter my most recent Tuesday Morning find: a card stock stack called Crimson by American Graphics. Just the thought of a monochromatic Christmas card made me happy. 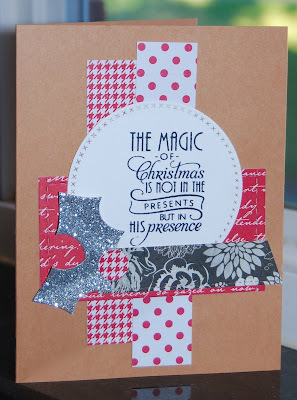 The stamps are from Verve's Peace on Earth and the holly is a Little Inker's Holly Jolly die. The Verve Sketch Challenge is still open for a couple days. 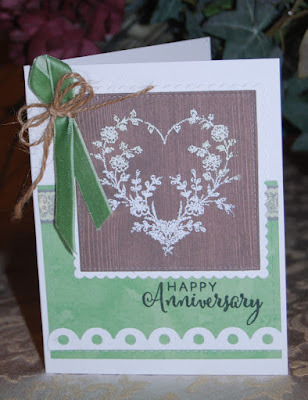 This card is featured at the Crop Stop Blog. 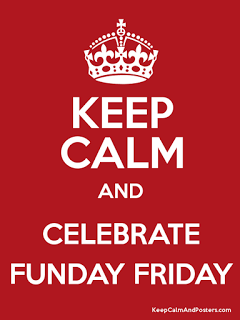 Stop by for all the details. Thanks, Crop Stop, for the fun challenges and the great new supplies. Thanks to everyone who stopped to look. 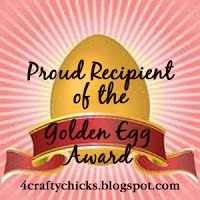 I am ever so thankful to have received a gift voucher from Waffle Flower during the Fall Coffee Lovers' Blog Hop. As a purse lover, I nearly swooned over the Purse-Nality Stamp and matching die. Thanks so much to the Nina at Waffle Flower for sponsoring the hop and for the awesome prize. I can make paper purses to my heart's content! Along with the Purse-Nality stamp set, I used some purple scraps that were part of a card for Becca Cruger's Hop to Stop Domestic Violence, and dies from MFT, LID, and Verve. 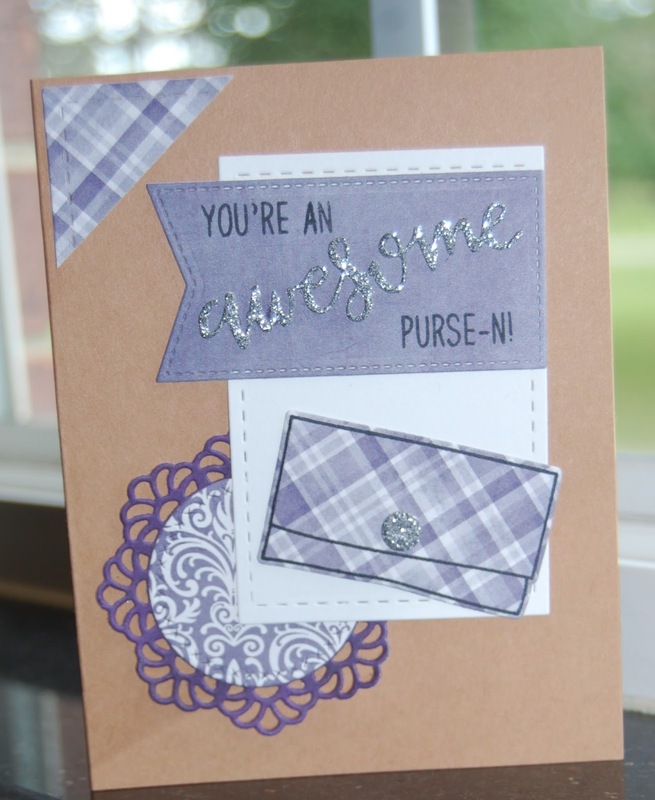 The word "awesome" is a die from Verve's Amazing Adjectives, and it cut perfectly from silver glitter card stock. I also used this week's Mojo Monday Sketch. Thanks for stopping to look. Hope someone reminds you today how awesome you are! 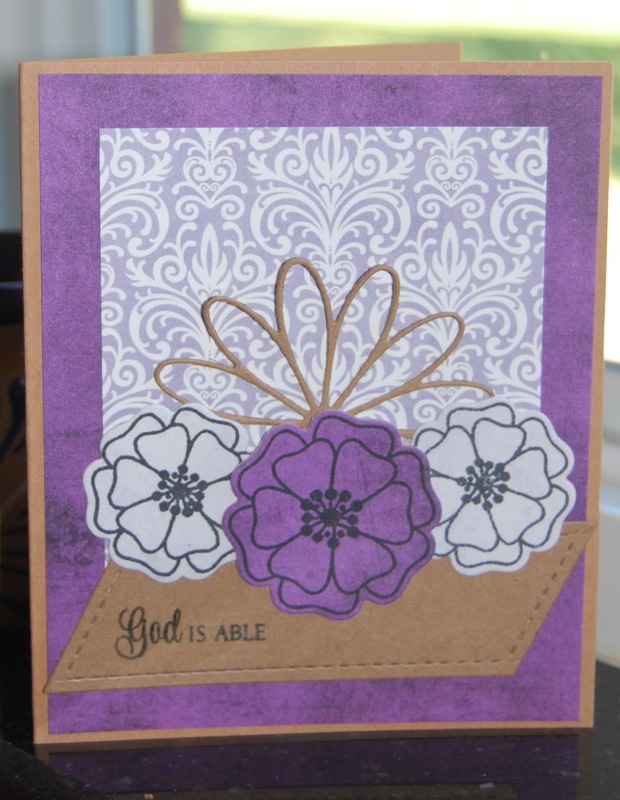 The second Verve sketch for this month provided the layout, and I chose to create with purple and to use the God is ABLE sentiment in honor of the Hop to Stop Domestic Violence. Praying that all who suffer from mental and physical abuse will reach out for help and will believe that God is able to give them hope and to help. 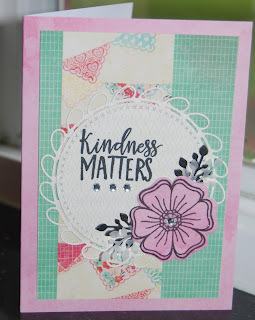 The sentiments from Verve's Kindness Matters are wonderful for notes of appreciation, and the flowers are so pretty. 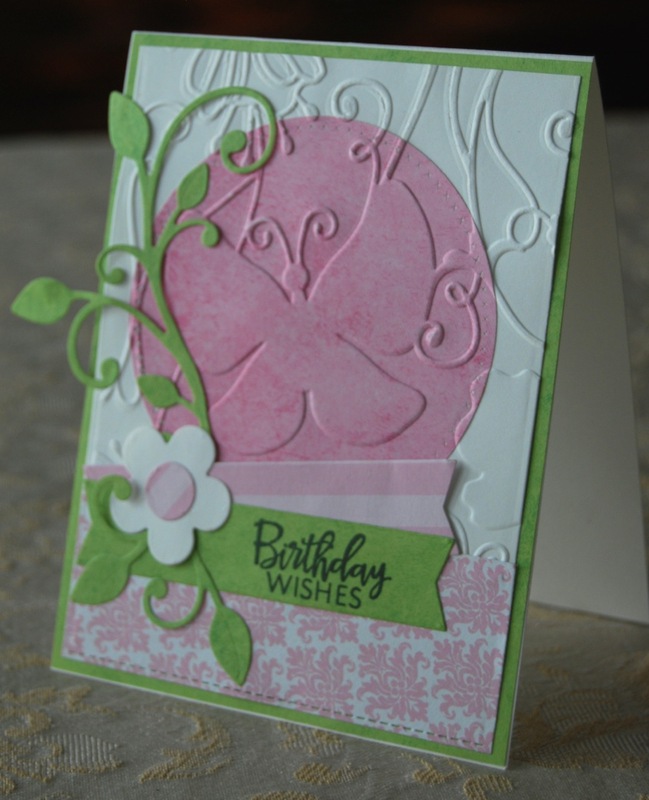 This card was inspired by the Simon Says Stamp Challenge to Think Pink. The Crate Paper collection called Fourteen includes some lovely pink papers----I love the combination of colors and vintage handkerchiefs shown on this sheet! 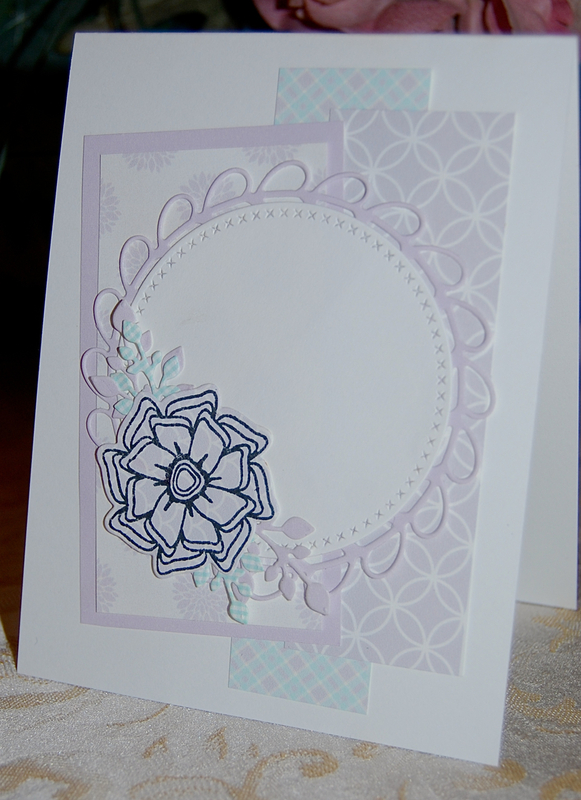 The card was finished off with a few rhinestones, Wink of Stella, and vellum leaves. 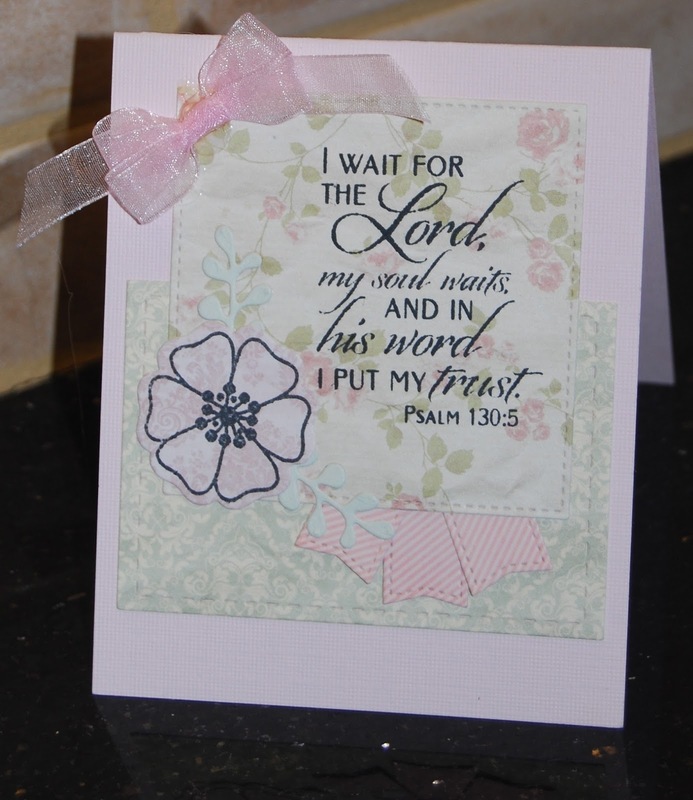 In July, I was blessed to receive a goody bag from Crop Stop, and am thrilled to share a card there! I love a good stack of coordinating papers, and this line from Glitz was such fun to use. Crop Stop has some of the hard-to-find Glitz papers and is also a great source for beautiful ribbons, adhesive-backed pearls, Memento inks, and MFT dies. I am thankful for the sweet prize offered by Crop Stop and for the inspiration and pleasure that comes from browsing the link-up. Thanks, Crop Stop, and to all who dropped by to look. 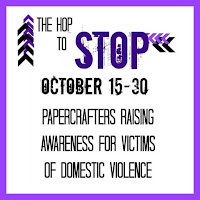 Most of this tag is made from recycled scraps left from my card for Becca Cruger's Hop to Stop Domestic Violence. The Pretty Pastels are from Just Peachy Designs and were die cut from the Gift Tag Die by Reverse Confetti. The flower is stamped from the Beautiful Things set by Verve and was watercolored with pencils and a water brush. The tag topper, white wreath, and plaid heart were in a pile on my desk. It's fun to have something made from scraps! The challenge is from Jo's Scrap Shack, and you can play along until October 21st. 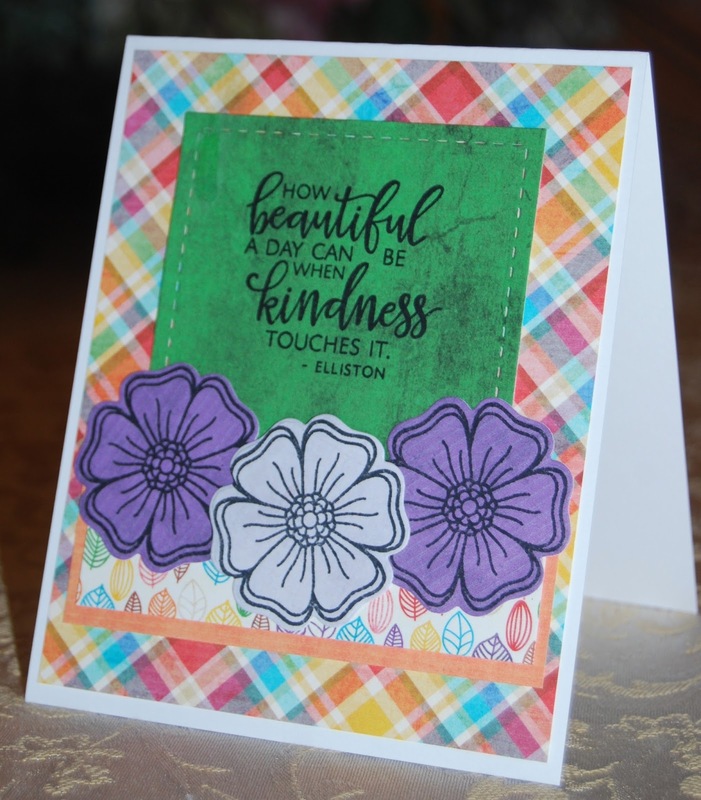 This card was made to share with Becca Cruger's Hop to Stop Domestic Violence, and I chose to photograph it before adding a sentiment as a reminder that we all need to be a voice to defend the defenseless. A couple weeks ago, our sermon was on Micah 6:8, and we were encouraged to exercise mercy and justice toward widows and orphans, to be a voice for the unborn, and to be sensitive toward the topic of domestic violence. Domestic violence is all around us, according to the numbers that Becca shared in her post. Perhaps someone in our workplace, school, church, or neighborhood needs our help. 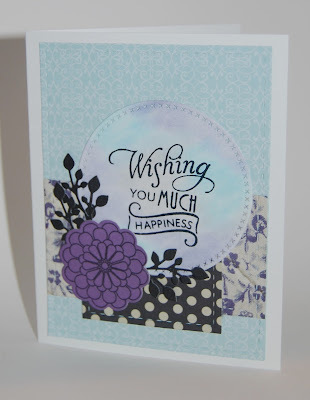 My card includes digital papers from Just Peachy Designs, Verve Stamps, and a Reverse Confetti Die. 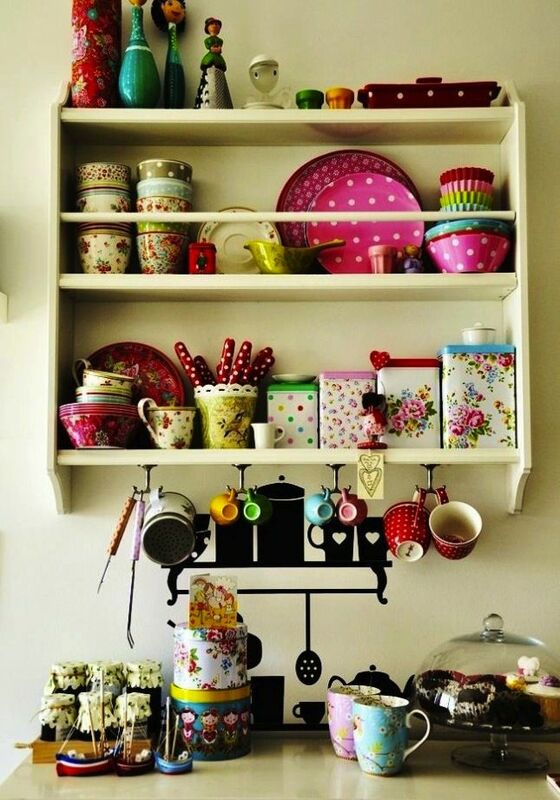 The Verve October inspiration photo is absolutely loaded with potential! The vintage metal canisters with the multi-hued bouquets against the white background caught my eye, and it was fun to "pick flowers" from several Verve sets. The arrangement contains blooms from Kindness Matters, Beautiful Things, and Autumn Blessings. All the flowers and leaves are colored with watercolor pencils and a water brush. 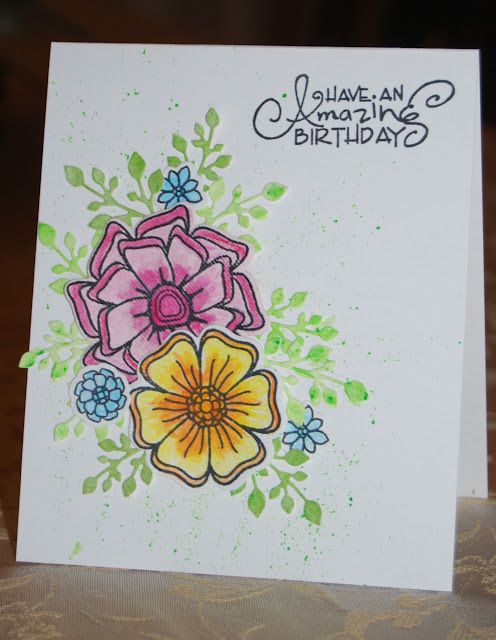 Before cleaning the green from the water brush, I used the residual color to splatter some fine drops around the flowers. 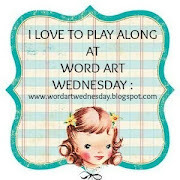 The sentiment is from Poppy Birthday, also by Verve. I am blessed to work with a wonderful team of teachers and two of them have birthdays next week. 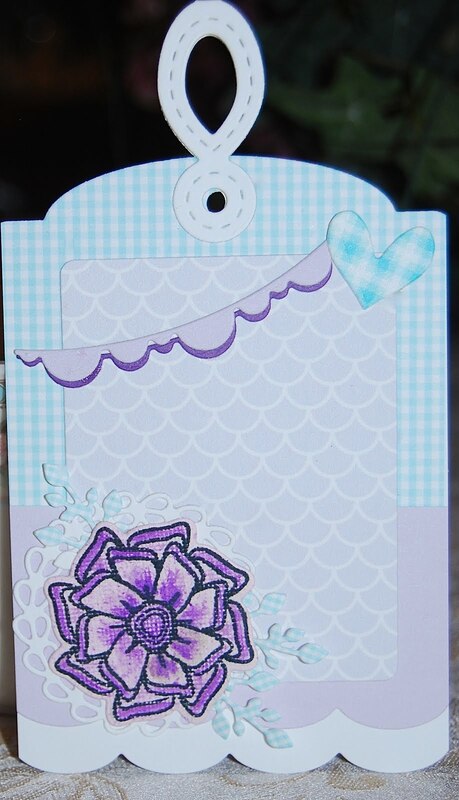 I am excited about sharing this card and making the other this weekend. The recipient of this card has had surgery and is the mom in a busy family. I'll tuck in a gift card for a meal and include a plate of home made cookies. The card came together quickly with Fleur Suite digital papers from Far Far Hill and the current Viva La Verve Sketch. The stamps are from two Verve sets: Beautiful Things and Inspire Hope. It's in my go-to style of Clean and Layered and was lots of fun to make. Hope it brings some encouragement. This is my second card using the Mojo Sketch, and I took a few liberties with it, but love how it turned out. 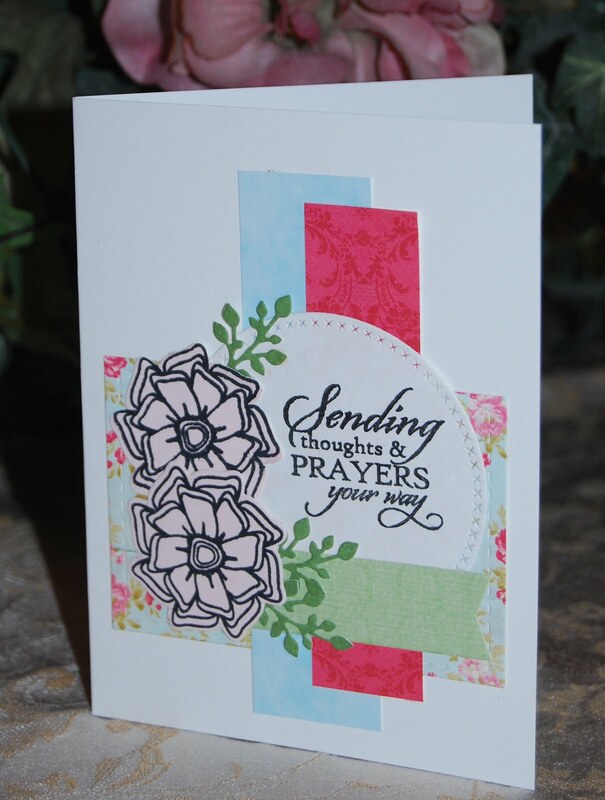 The papers are from Far, Far Hill, and the stamps are by Verve: New Mercies and Joyful Blooms. The stitched dies are by Little Inker and My Favorite Things. 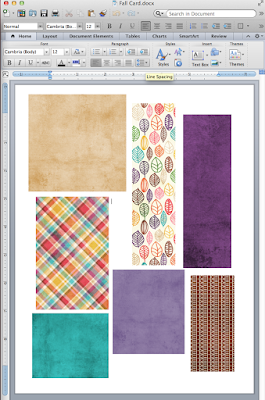 I have been pining for some pretty plaid papers---my class has been working on alliteration--- and found an entire collection of gorgeous digital papers by Harper Finch which are shared on her blog. The photo below shows how I arranged sections of the digital designs in Word in order to print them on card stock for stamping and die cutting. A little advance measuring means very few left-over scraps. I am so thankful for wonderful card sketches, inspiration photos, and lots of fun places to visit for inspiration and challenges. One of my goals this morning was to have some time to make a card, and it happened! 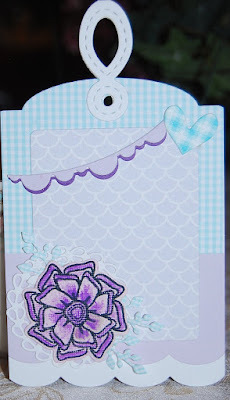 Linking to Mojo Monday, Inspired by All the Little Things and 4 Crafty Chicks Die Cut Challenge. There is an occasion for a thank-you gift in the next week, and I often give cookies as a way of expressing gratitude. 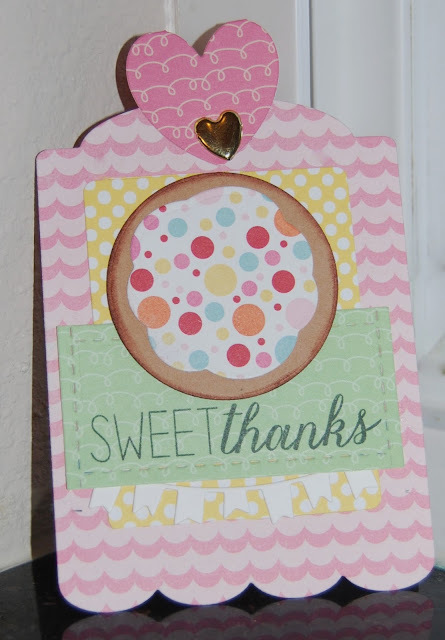 This set--called Donut you Know--from Reverse Confetti has the cutest sentiments and dies. I like to use the donut die without the center opening to make "cookies". The tag and heart-shaped topper is from RC, too! 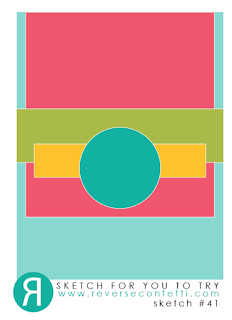 I adapted the Sketch for You to Try and used it for the tag. The September Diva Inspiration Challenge is winding down on the Verve Blog, and I couldn't resist making just one more card based upon the beautiful photo. 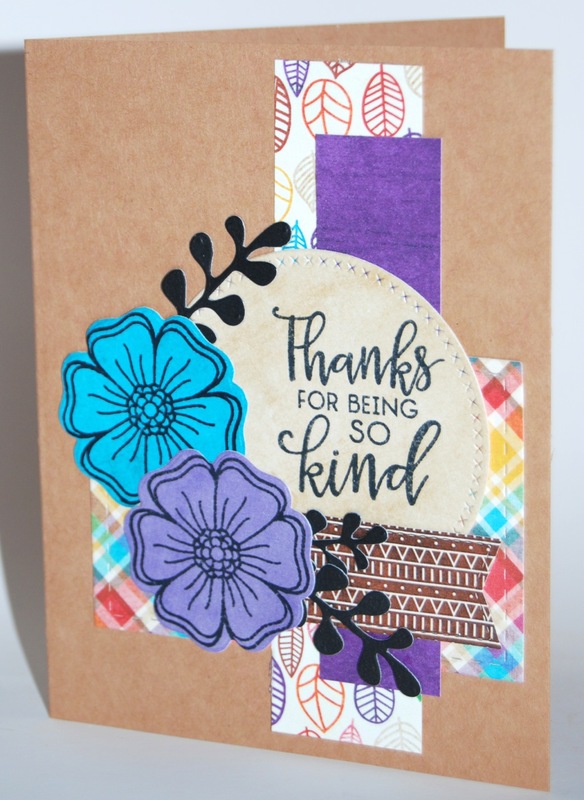 The pretty aqua paper used for the largest panel was a thank-you enclosure with a recent Verve order. 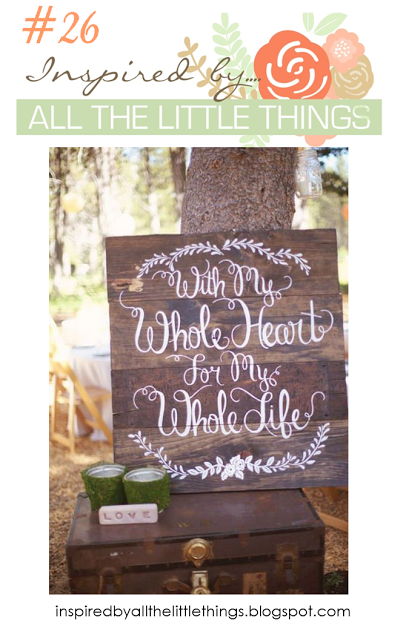 Resisting temptation to hoard it, I added a chalked circle, some scraps cut with stitched rectangles, and a sentiment and flower from Verve's Brighter Days. The sketch is shown below and is from the Reverse Confetti Blog. This card will hit the Post Office tomorrow. It's for a special upcoming birthday. I am also addressing a couple cards for Cole's Foundation. 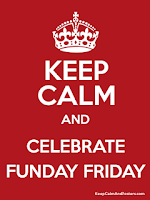 If you are not familiar with Cole's Foundation, it's a place to support families facing childhood illnesses. Cards and prayers are always welcome there.